Do I Need Special Certification To Be An Emergency Room Nurse? Is the a special certification to be an emergency room nurse? What degree is required to be able to specialize in E.R. patient care in the field of nursing? These are common questions that are presented by nursing students who are certain that they want to work in a fast-paced and diverse environment known as the emergency room. With so many different settings to work in, and so many different specializations to choose from, deciding what area of nursing to specialize in can be an overwhelming decision. Read on to learn about your roles as an emergency room nurse, and which certification will help you land a job in the ER. What Are the Roles and Responsibilities of an ER Nurse? orders in the process of tending to and treating a patient. From prioritizing patients and assessing their condition, to monitoring the patient’s vitals and setting up the IV’s, an ER nurse has a lot to do throughout the department. They will also need to follow the policies and procedures of the facility and the state so that they are in compliance. What Are Educational and Certification Requirements? If you would like to work as an ER Nurse after hearing about the role that they play in an emergency room, you have to start by attending college and then move on to earning your certification. After you have completed a Bachelor’s in Nursing program that is registered and accredited, the next step will be to earn your certification through the Emergency Nurses Association. To be granted certification, you will need to take an Emergency Nurse exam that will test you on ER situations to see if you know how to respond to different types of serious emergencies. There are also other types of certification that can be pursued to treat specific patient groups. One common choice for professionals who would like to work with children is the Certified Pediatric Emergency Nurse, according to the Pediatric Nursing Certification Board. You should compare the credentials before you set up a date to test. It is in your best interest to take an educational program accredited and approved by the Emergency Nurses Association if you known your intentions are to be certified. You can take specific courses through the Emergency Nurses Association, like the Trauma Nursing Core Course or the Emergency Nursing Pediatric Course to better prepare for the ENA exam. 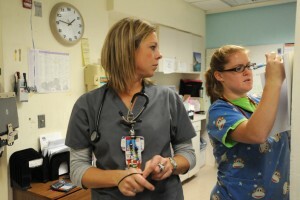 An ER nurse plays a vital role in the operation of ER facilities. Because you will need specialized skills to work in this field, you can expect to earn a good salary which will average between $23 and $33 per hour depending on your location and experience. Having a certification is likely to ensure your pay starts at the upper end of the salary range. It also ensures that you have the skills needed to react and respond in a serious emergency situation. Now it is time to earn your special certification to be an emergency room nurse.